Gadget blog Engadget claims to have leaked documents that outline Dell's upcoming tablet computers. Forget about boring old next-generation iPhone leaks, more rumours are afoot about Dell's aggressive moves into the mobile space with its line-up of Android-based tablet computers. Engadget has uncovered what it claims are leaked documents detailing information about the 5-inch multitouch Dell Streak tablet (also known as the Dell Mini 5 ), and Dell's 7-inch multitouch tablet device, known as the Looking Glass. Engadget's images of marketing material for the Streak 5 reveal the device may be released this summer or possibly as late as September, while the Looking Glass looks set for a November release. There's also no word on pricing for either device. According to Engadget, Dell's follow up to the Streak (aka Dell Mini 5) will be a 7-inch tablet called the Looking Glass, if Engadget's leaked documents are correct. The new device is said to be running Android 2.1 and will include a 7-inch WVGA screen with 800 x 480 display resolution; 4GB RAM; 3G, 802.11 b/g/n Wi-Fi and Bluetooth 3.0 connectivity; 1.3 megapixel camera (no mention of a front-facing camera); and optional TV tuner. The Looking Glass will also have a memory card slot supporting SD, SDHC and MMC formats, but maximum storage will be relatively low at 32GB. Engadget's alleged leaked Dell documents also say the Looking Glass will be powered by Nvidia's Tegra 2 mobile system-on-a-chip processor, which was designed primarily for tablets. 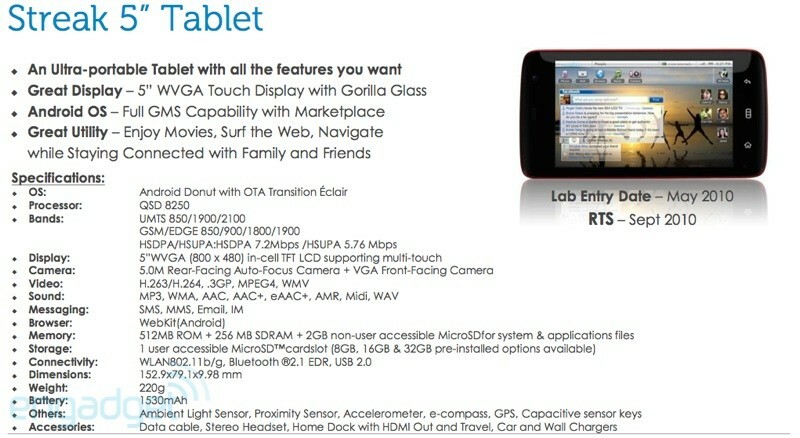 Tegra 2 uses an ARM Cortex A9 dual-core processor. Interestingly, Engadget points out that its Looking Glass screenshot shows the device running AT&T's U-Verse browser, the carrier's Internet Protocol television (IPTV) service. However, there's no word on whether this is meant to show off the device or some kind of IPTV deal between Dell and AT&T. According to Engadget, Dell also has some interesting things lined up for the oft-discussed Dell Streak/Mini 5, according to the leaked documents. It's already been leaked that the device will have a 5-inch WVGA screen, Qualcomm's blazing-fast 1GHz Snapdragon processor , a 5 megapixel camera and a microSD card slot (maximum 32GB). But it looks like in addition to 3G and Bluetooth 2.1 connectivity, the Streak 5 is going to be stuck with 802.11 b/g Wi-Fi, and lack the faster 802.11n standard. The Streak may also be coming in 9 different colors including black, silver, red, purple, blue green, pink and two multi-colored designs called Kaleidescope and Sea Sky. Engadget still believes the Streak will be available this summer, likely running Android 1.6 with a September upgrade to Android 2.1. Engadget leaked slides appear to back up that theory, except for this slide which lists the Streak's RTS date as September 2010. Now, I'm not sure exactly what 'RTS' stands for, but based on my research I believe it's something like 'Release To Stores/Shelves/Sales.' So it's possible the Streak may not be released until September, so perhaps the device will be running Android 2.1 at launch instead of the planned over-the-air upgrade. It's hard to know for sure, since there are seemingly two contradictory bits of information here. Regardless, both the Streak and the Looking Glass appear to be interesting additions to Dell's device lineup.